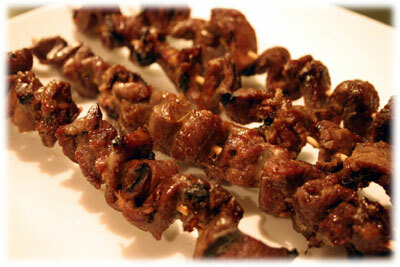 Most beef shish kabob recipes taste their best when when you marinate them overnight. Careful though, too long and the meat can go mushy. The marinade flavors tend to absorb in beef much slower and not as deeply as chicken or shrimp so that's why a little longer is better. 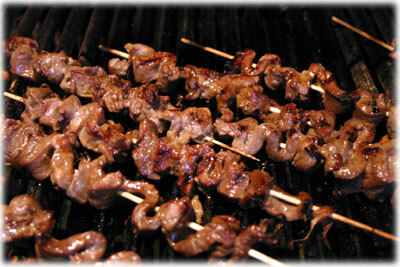 The grated ginger and sesame oil really gives these shish kabobs a genuine Korean BBQ flavor. These are also great for laid-back entertaining, use shorter skewers (3" or 4") to serve as appetizer kabobs or use the 10" - 12" skewers for serving as main course. 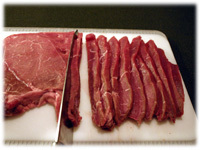 Look for thinner Sirloin steaks when they come on sale and slice them into very thin ribbons of beef. Update 6/17/14: This is one of the first recipes I posted on tasteofBBQ so looking back now I admit the picture above really doesn't do them justice, but they really do taste fantastic. Note: for best results marinate the beef overnight. Trim the steak of any fat. Slice the beef across the grain into 1/4" strips or ribbons. 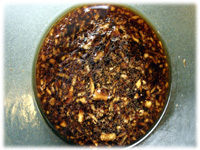 Mix all the korean marinade ingredients together in a glass bowl or resealable jar. Stir well to completely blend. 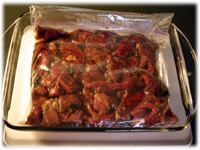 Pour the contents of the marinade in a resealable plastic bag and add the beef. Squish the bag around so the beef strips are fully covered in the marinade. Place the bag in a glass dish in case the bag leaks and keep in the refrigerator overnight. Turn the bag over at least once if possible half-way through the marinating time. Clean and oil the grates of the BBQ well and preheat to 400F - 450F. Remove the beef from the bag and discard the marinade. 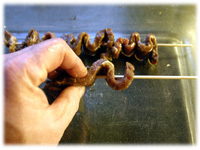 Thread the ribbons of beef on the bamboo skewers in an over-under pattern as shown in the picture. Place the shish kabobs on the grill and close the lid. In 5 - 6 minutes lift the lid and wiggle the skewers to loosen them from the grates. If they lift easily and are showing nice brown marks underneath go ahead and flip them over. After another 5 - 6 minutes check the shish kabob skewers again. If they're browning nicely and they look done, they likely are. 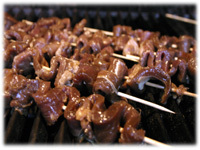 The meat is thinner on these than most beef shish kabob recipes and the way you've threaded it on the skewers these cook fairly quickly.